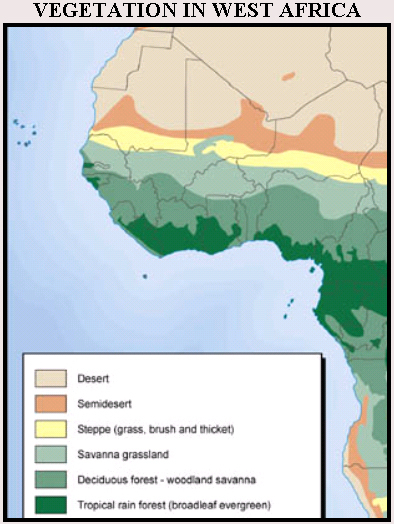 Within the region of West Africa, the environment ranges from lush tropical rainforests to arid desert. In general, as can be seen on the map below, the climate gets wetter as you move to the south and drier as you move north. 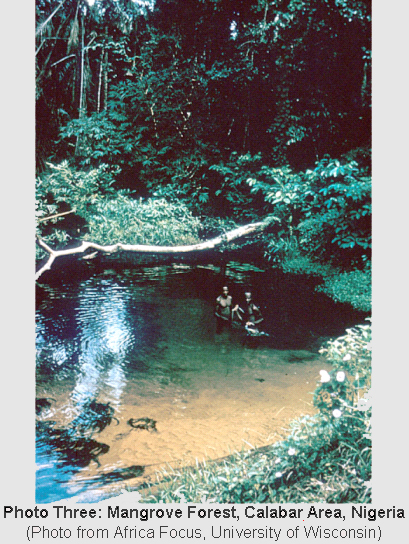 The photos below also give you an idea of the range of physical environments found in West Africa. Some regions (such as in Photo One) are very dry, making farming difficult if not impossible. Other regions have better conditions for agriculture (like Photo Two), and others are left unfarmed as forests (such as Photo Three). 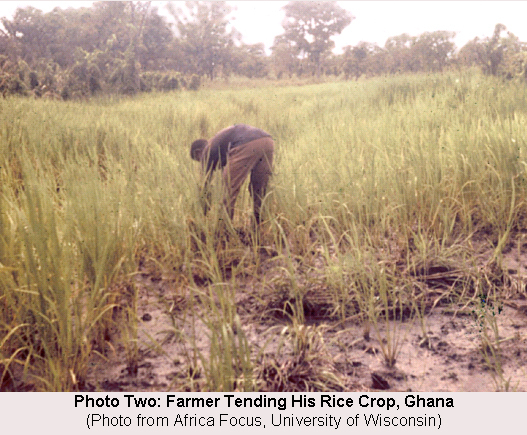 Many people in West Africa are farmers, and as such they depend on the rainfall for their livelihood. Some regions can fluctuate from year to year in terms of rainfall, which can result in droughts or poor harvests from time to time. This is especially a problem in the region of West Africa called the Sahel (indicated roughly by the orange, yellow, and light green bands in the map above). Regions above this zone are generally too dry to farm, so people who live there often herd animals for a living. Note the connection between the vegetation map above and the population map below. In general, population density is higher in regions where there is more vegetation and rainfall. This makes sense, doesn’t it? Obviously, people need food and water to live. So those places with more capacity to grow food are more heavily populated. Those regions where food cannot easily be grown are less populated. What about sources of water other than rainfall? 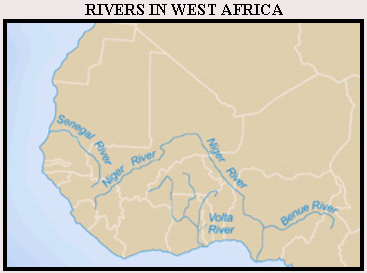 The map below shows the major rivers that are found in West Africa. Can you find any connection between this map (below) and the population map (above)? Does it seem like people are more likely to live near rivers and seacoasts than not? Drought, soil erosion, desertification, and deforestation are prominent and also interrelated environmental problems in West Africa. All of these contribute in some way to a lack of necessary natural resources for people’s daily lives (i.e. food, water, firewood, etc.). As mentioned above, some regions of West Africa suffer much more from these problems than others —in particular the Sahel region. 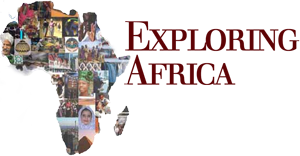 Countries included in the Sahel are Senegal, Mauritania, Mali, Burkina Faso, Niger, and Chad (a country just to the east of Niger). 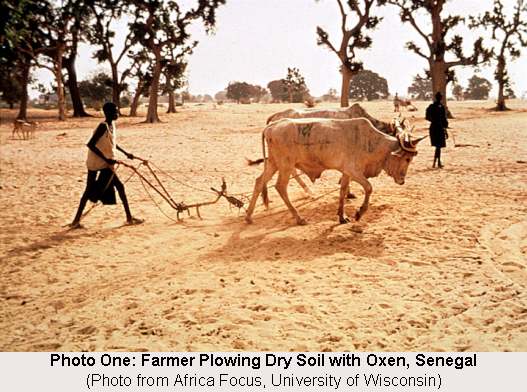 The Sahel region experienced widespread famine during the years 1968-1974 and 1984-1985. In general rainfall has decreased since the 1960’s, and as the population has also grown in much of this region, it has become difficult to produce enough food locally to feed everyone. As farmland is overworked, forests are cleared, and rainfall decreases, the environment is becoming slowly more desert-like in the Sahel. Below are two case studies of specific environmental concerns in West Africa today. Lake Chad, once one of Africa’s largest freshwater lakes, is located where the countries Chad, Cameroon, Nigeria, and Niger meet. 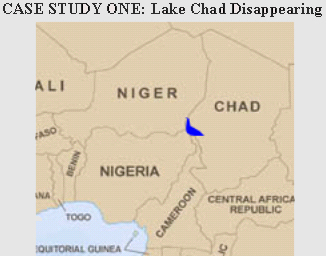 Over the past few decades Lake Chad has been shrinking. It used to be 9,700 square miles in 1963, but in 2001 it measured only 1/20th of this size. What is happening to Lake Chad? Researchers from the University of Wisconsin published a report in 2001 to answer this very question. They explain that decreased rainfall, overgrazing of the land, a growing population, and increased irrigation in the region have all had a domino effect on one another resulting in shrinking Lake Chad. In the past, a vibrant economy existed on the lakeshore, and people lived on the islands of the lake. Today due to the drastically changing environment, this way of life has collapsed. 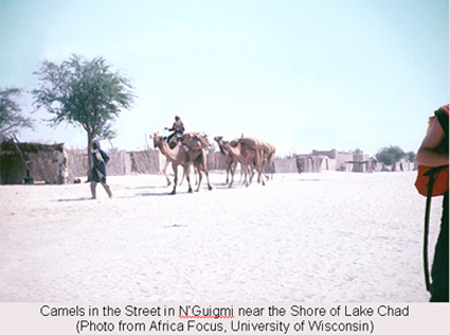 For example, N’Guigmi, Niger used to sit on the shores of Lake Chad, but today it has become a desert town. To reach Lake Chad from N’Guigmi, one has to travel many miles through the sandy lakebed to the shoreline, where one finds only a few scattered people fishing and planting. Ghana is a country that is rich in natural resources. Most prominent are its bodies of water, forests, and mineral deposits. Important bodies of water include a number of rivers, one of the world’s largest artificial lakes in the world (Lake Volta), and the seacoast. Mineral deposits include gold, diamonds, manganese ore, and bauxite. Particularly since the 1980’s, Ghana has suffered from rapid deforestation. This is due to a number of reasons. First, World Bank and IMF Structural Adjustment Programs that Ghana was obliged to implement promoted the export of timber. This quickly depleted forestland. 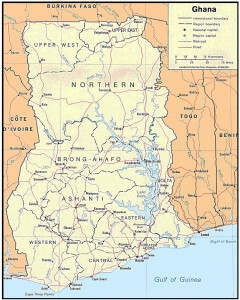 Ghana’s National Coalition of Civil Society Groups against Mining in Forest Reserves reports that around the turn of the century, Ghana’s forestland was about 8.2 million hectares (about 20 million acres). In 2003, they report that it is less than 1.6 million hectares, and only 2% of that remains in excellent condition. In May 2003, this group is in the midst of leading a campaign to keep mining companies out of the forests in Ghana, which would, of course, further deplete Ghana’s forestland. You may want to do a search on the internet to find more up to date articles on this topic as well. Try using keywords such as “Ghana,” “mining,” and “forest” to see what you can come up with. 1. Name the three countries in West Africa that have desert vegetation in their northern regions. 2. Which West African countries have tropical rain forests? 3. 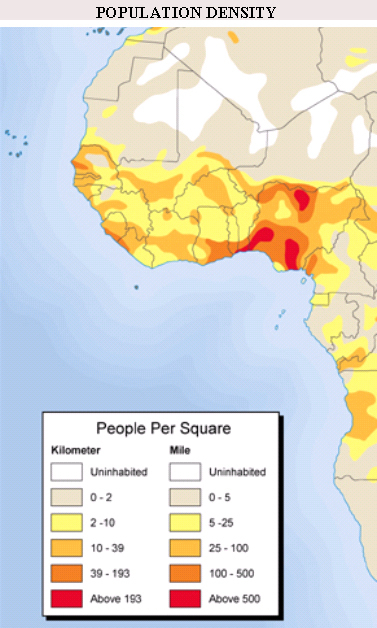 Which country in West Africa appears to have the highest population density? 4. What are the four countries that border Lake Chad? 5. Name all of the West African countries that the Niger River flows through. 6. 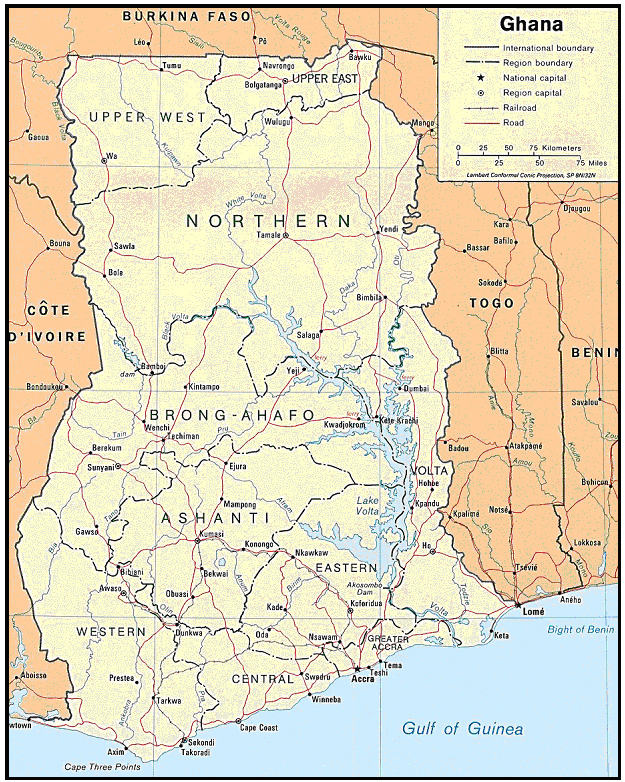 What are the three zones of vegetation that Ghana has? 7. What is the name of the largest lake in Ghana?